Paul Sauer, the famed Bordeaux-style red blend from Kanonkop in Stellenbosch is off the boil and has been for a while, There, I said it. From vines with an average age of 24 years, the 2012 is a blend of 70% Cabernet Sauvignon, 18% Cabernet Franc and 12% Merlot, the wine matured for 24 months in French oak, 100% new. On the nose, red fruit plus a hint of mint but what is troubling is that there’s also an unfortunate reductive, dare I say rubbery note. The palate shows sweet, ripe fruit but lacks real depth and structure. The label will dupe many but this is South Africa’s “First Growth” and should be better. Wine Cellar price: R490 a bottle. EINAAAAAA! I’ve given preference to the Cabernet Sauvignon since 2005. Opinion, Christian? 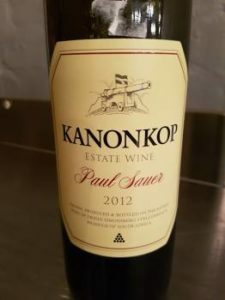 Hi Joe, If I was a rich man, I’d be buying Kanonkop Pinotage (standard version and Black Label) for the cellar.